I promise you: it doesn’t have to involve getting rid of your lattes. The key to cutting expenses out of your budget is to do it in a way that is sustainable. Example? Most of us can’t go cold turkey on all things screen related (Netflix, cable, movie outings, video game purchases, etc.) and expect to be able to sustain it especially in a cold Canadian winter. Like a diet, your cuts have to be healthy, reasonable and sustainable. Crash diets don’t work and neither do cold turkey expense cuts. Brian O’Connor, who wrote ‘The $1000 Challenge’, cut $1000 from his family’s budget in 10 weeks. His tips are sound and his wisdom is too: “It’s not always that hard to save money; it’s just a whole lot easier not to save it.” We CAN menu plan, or coupon, or engage in one of a dozen other ways to cut expenses but it’s easier not to do those things, particularly when we’re busy. This brings me back to making cuts that are sustainable. 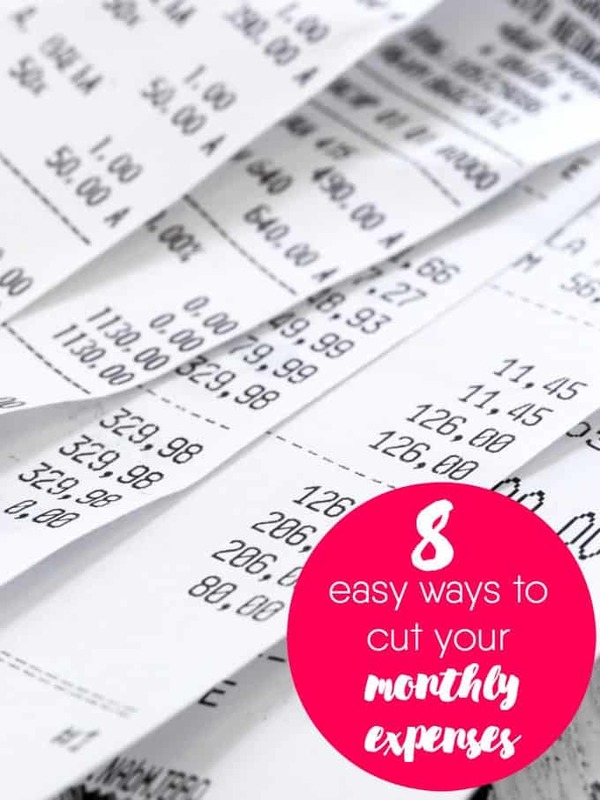 The first step to finding these reasonable cuts to your expenses is knowing what your expenses actually are. Keep a spending diary for 30 days. Write in it every single thing you spend on, whether it’s $2.50 cash for the soft cone from the ice cream truck that went by your house or $1,750.00 for your mortgage payment. Everything. When you’ve done that, you’ll have a bird’s eye view on where your money is going every month and there will likely be some obvious expenses that you can get rid of, quickly and easily. If you’re a coffee nut like me, the odd trip to Starbucks probably isn’t coming off the list, but I can cut down my book purchases by leveraging the library more. See? Priorities. Here are some ways you might consider cutting a little more from the budget every month. 1. Cut the cable. Thanks to streaming services like Netflix and Shomi, you can get rid of your cable package and still have a variety of programs and movies available for viewing. Even your household news junkie can stay up to date with local channels streaming much of their content online. 2. Unplug. No, I’m not referring to turning off your phone (although, that’s by no means a bad idea sometimes!) I’m referring to literally unplugging appliances that you don’t use. Go to countries where electricity is expensive (Great Britain, for example). You’ll notice that the coffee machine, kettle etc, are always unplugged when not in use because plugged in, they’re still an energy and money drain. 4. Takeout. Convenient it might be; cheap it is often not. Invest some time and effort in meal planning and cut your takeout and restaurant meals down. And if you’re like a friend of mine who rates cooking up there with a root canal, there are dozens of services that will deliver everything you need to make an easy home cooked meal, at half the price of takeout. Healthier for you; healthier for your wallet! 5. Movies. Going to the movies these days, especially with kids, is an expensive proposition. Take advantage of Saturday Family specials at the theatres. Better yet, rent the latest flick from Google Play and stream it on your television. A little homemade buttery popcorn, a little juice (grape for the kids; fermented grape for you!) and you’ve got the makings for a comfy at-home movie night that won’t break the bank. 6. Outings. There are discount codes and coupons everywhere for just about everything you and your family might want to do. And if you are the kind of family that visits a certain place—the zoo, for example—more than twice a year, look into a family membership. These can often save you a lot on entry fees, parking and offers discounts on shopping and dining. 7. Recycle clothes. For me, it’s hard to find clothes that I like or would wear in a used clothing shop, but for the kids? No problem. There are shops everywhere, even online, where you can get the summer shorts or back to school shirts that you’ll need, at a fraction of retail. 8. Cell strategy. Monitor your data and text usage as well as your family’s for a month or two and then see if you can do better with a family plan or other package. While we’re talking about phones, if everyone has a cell at your house, it’s time to get rid of the extras on your home phones, like call waiting. Changes in spending habits are like changes in eating habits: they’re lifestyle changes that take time to work into your life but once entrenched, can go a long way to keeping a healthy bottom line. What are you favourite ways to save money? Do you have a ‘go to’ strategy? Every month I go over my bank statement and look for ways I can cut back. The following month I attempt to avoid the same impulse spending. Lol these are great ideas. Too bad I’m already doing them . Great tips, already doing most of them now. I also meal plan to help cut down on the grocery bill. There are a lot of activities and fun things to do around the city that are free… Museums have free days/nights once a month (so you can still introduce your kids to culture), there are tons of outdoor activities you can participate in and inspire a love of nature and physical activity. I also meal plan… Freeze, make ahead meals for days when things get nuts so I am not tempted to order take out. Movies for us are rare…..take out almost never happens, and family outings are pretty regular but we always find a way to save before heading out. Planning ahead and finding discounts are totally worth the effort! It’s just insane how quickly these things add up!!! Great tips we have been looking at switching to Netflix to save money on the cable bill and I think it’s time to take the plung. Tight on money rn so any tips help ty :). Great list of “cutting expenses ideas”! I’m a sucker for books. Having a library card goes a long way! And Edmonton public library is awesome! If everyone has a cell phone why not get rid of the landline. Most plans have unlimited L.D. and texting now too. SAdly we’ve never had cable and the kids didn’t even watch tv when there were home and went to school (And ironically my daughter went to film school when she finished grade 12) Our town actually only got faster internet 10 years ago and there are actually some surrounding communities that are still dial up. We do have a TV but we don’t have it plugged in. Our coffee machine is a Bunn machine so if you unplug it, you’d not have hot coffee (the water sits in the hot tank and you get a 12 cup pot in 3 minutes. Its from one of the cafes we had) I have a front load and i don’t think I’ve ever used the super hot water function. Our town is also tiny enough there is no take out (hubby drives a motorcycle to work so none being brought home that way either.) We used to take the kids out once a month as a treat (NOT Macdonalds, a real sit down restaurant!! ) I think the last time we went to a movie it was my daughter and I , for free, Sweeney Todd (the scene card gives you free movies) Once again, with us not being in the city, driving all that way, well…mostly doesnt happen. Work clothes are very old, worn out ones because of the type of job I do and in the winter time most of us wear PJ bottoms. If you want to destroy a top or pants, the bleach and cleaning products at work will do the job. And my cell phone plan is quite outstanding … I’m with SKtel and my daughter is with Bell and so far SKtel is way cheaper (by about $45/month) PLUS she doesn’t have unlimited everything like sktel’s plans. I think my biggest tip is…do you need it or want it. !!! Because we’re a min wage earning family (of 4) I had to work to provide anything for the kids. My son ended up needing braces and that was $4500 out of pocket expenses ..but you knw what!! Even with all of that I always put their family allowance towards RESP’s so that they’d have that for school. No cable for 10 years. Eat out maybe once a month. Shop thrift stores when I need something. Manage to have a full life. I’m going to try the unplug strategy. Thanks for sharing! I used Ebates when making purchases online, and always check retailmenot.com for coupon codes! Great list! We no longer eat out we make special meals at home and try to save be turning of light when not in use .We freeze leftovers for later lunches .This time of year when veggies are cheap we bottle them for winter.